Feyenoord ended Heracles’ unbeaten run at home, coming away with an impressive 2-0 victory. Groningen dragged themselves out of the drop zone with a 2-0 win over Heerenveen. Ajax continued their excellent run with a 7-1 win over Excelsior. PSV had suffered a blow to their CL aspirations after defeat in midweek to Spurs, but their machine continues to chug on domestically, keeping their 100% record with a 4-1 win at De Graafschap. Luuk de Jong, who netted a brace for PSV in this game, is their only representative in the XI. Vitesse, Emmen and Venlo all won away at home, while Willem II beat Zwolle 3-2. Real Madrid loanee Martin Odegaard scored for Vitesse. 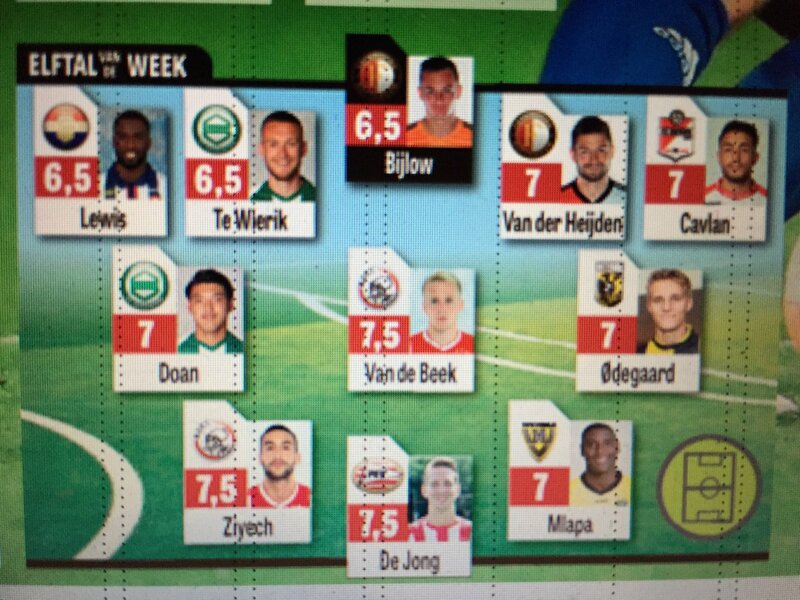 The best players according to the ratings were the trio of Ziyech, Van de Beek and De Jong, all of whom, got 7.5 each.